I wasn’t aware of blossoming trees when I was growing up. I don’t remember if they weren’t as noticeable in temperate Southern California or if I was just too fixated on boys to notice my surroundings. Now every year when the trees sprout their lacey blooms I’m charmed by the delicate pink and white frills accessorizing the dark limbs. 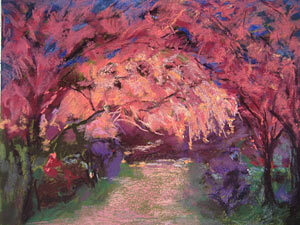 On a nearby street there is a driveway magnificently lined with cherry trees. Paintings and photos of this alluring location can be seen throughout the pages of Growing More Beautiful. I make sure I don’t miss the fleeting opportunity to paint this lovely display. Last week, dark rainclouds threatened to let loose at any moment. But it was Wednesday afternoon, my precious time to paint. The resulting painting, Dark Blossoms, captures the mood of winter and the joyful awareness that spring is just around the corner. I want to bring something new to a painting of a familiar location, not just for the sake of being different but to build on my experience and learn to see more deeply. This drive to grow and evolve is also reflected in our desire to update our wardrobe. The need for continued self-expression is one of the things that makes us look into our closet full of clothes and feel restless and dissatisfied.